If you are looking for a reliable and NAID-compliant paper shredding service in San Antonio, our company fits your requirements well. The shredding services we provide will ensure no breaches on your security because we handle paper shredding and records destruction concerns in an efficient manner. We adhere to the compliance requirements of your company and protect your good name. Scheduled arrangements can be made for document shredding services through our competent staff. We offer you services that can be availed on a monthly, weekly or daily basis. If you think that having frequent paper shredding services is not to your liking, one-time purges and cleanouts are also available from our company in San Antonio. Data Shredding Services specializes in records destruction. We are the least disruptive, most productive, economical, secure and complete means available to handle your confidential records and materials destruction problems. Data Shredding Services of Texas, Inc. – San Antonio specializes in records destruction of all forms including paper shredding as well as media material, hard drives, micro-film and more! Security breaches are not possible with the strict rules we implement in our document shredding processes in San Antonio. Small and large scale companies in San Antonio take full advantage of the paper shredding services we offer. We have become a reputable business that protects your business interests preventing corporate espionage and cases of fraud. These cases will cost your business a lot of money and cost your organization its good reputation. Maintain good business credibility by hiring our team of licensed experts in San Antonio for your paper shredding needs! 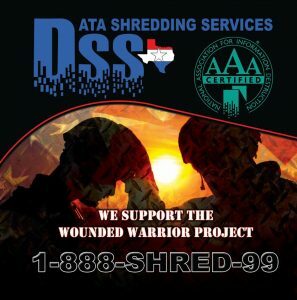 Data Shredding Services of Texas, Inc. provides both on-site and off-site paper shredding servicesin order to meet the needs which best fit your organization. Our state of the art paper shredding and media document destruction equipment are capable of shredding 6,000-8,000 lbs of material per hour. We offer the most secure document destruction service in the industry along with customer service that is second to none. We are committed to the success of our customer through providing service beyond expectation while maintaining the highest standards for security and ethics for the document destruction industry. We pride ourselves in consistently delivering high security, economic and convenient shredding services to each and every client.